Congratulations on your acceptance to the Eastman School of Music! Embrace your home away from home at Eastman’s Student Living Center. Develop practical skills and lifelong friendships in a community of musicians. Eastman’s Residential Life program provides opportunities for students to live and learn in the City of Rochester. 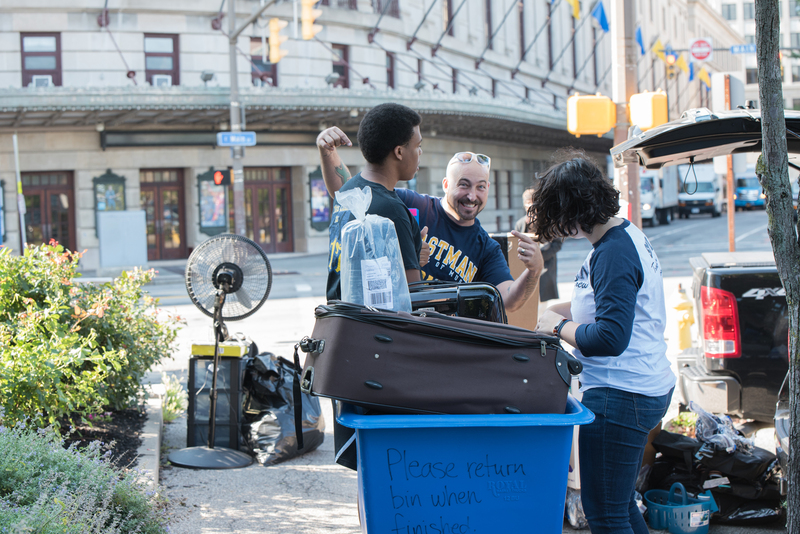 Eastman guarantees housing for Freshman, Sophomores, and Juniors, while additional seniors and graduate students choose to live on campus. 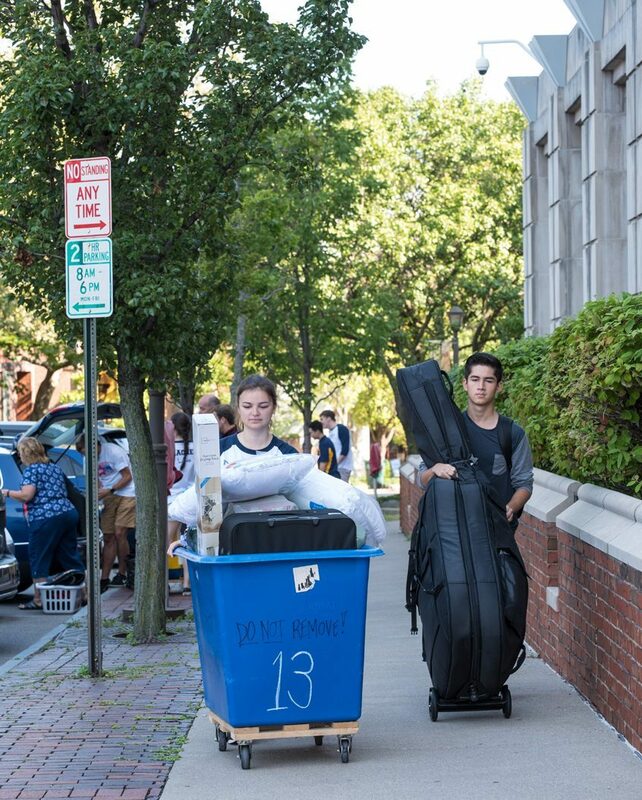 At the Eastman School of Music, we house first-year students together. This residential structure provides an opportunity for students to engage with social, recreational, and resource programs. The skills, closeness, and lifetime friendships that students develop as a result of this experience will ease students’ transition into the Eastman community. We encourage you to read the Residential Life materials carefully. These materials are designed to help you prepare for living at Eastman. If you have any questions, visit us at the Office for Residential Life in the Student Living Center, 100 Gibbs Street, Suite 103, call (585) 274-1106, check out our web pages, or email us at reslife@esm.rochester.edu. What are the advantages to living on campus? According to the American Council on Education, college students who live on campus are more satisfied with their experience, earn higher grade point averages, and are more likely to graduate. We provide safe, clean, furnished rooms with comfortable surroundings. Our main priority is to ensure that students are provided with an opportunity to have a community of peers, experience mutual respect with a roommate and a hall, share learning experiences with hall and floor mates, and get involved with the many University-wide activities and opportunities available. If you would like to live with a specific freshman student, you must indicate this student’s name on your housing contract and/or send an email to the Office for Residential Life. Please note that both students must indicate that they would like to live together. All roommate requests must be submitted to the Office for Residential Life by Friday, June 15. New residents will receive a letter about their housing assignment by the beginning of August. With that letter, you will also receive contact information for your roommate, a brochure about living with a roommate, a list of items to bring (and not to bring), information about your mailbox, and a list of important Residential Life dates for the 2018-2019 academic year. How do I introduce myself to my roommate? Roommate information is included with your housing assignment letter. We encourage you to contact your roommate before arriving at Eastman. It will be helpful for you to get to know each other, as well as plan on what items each person will be responsible for bringing. Remember to be open and respectful to your roommate, and your roommate should do the same for you. Living with another person can be a good learning experience, so try to be patient and understanding. Are room dimensions available for my room? Due to the unique architecture of the Student Living Center, room dimensions are not available. For information about what items are provided in your room, as well as a list of items you should and should not bring, please click here. When can I move into the Student Living Center? New international students, who will be attending the International Student Orientation Program, are permitted to move into the Student Living Center beginning Monday, August 20. All other new students may begin moving into the Student Living Center on Wednesday, August 22. Please coordinate your travel plans accordingly – students will not be granted permission to move in earlier than the dates indicated. How do I get my items into the Student Living Center? 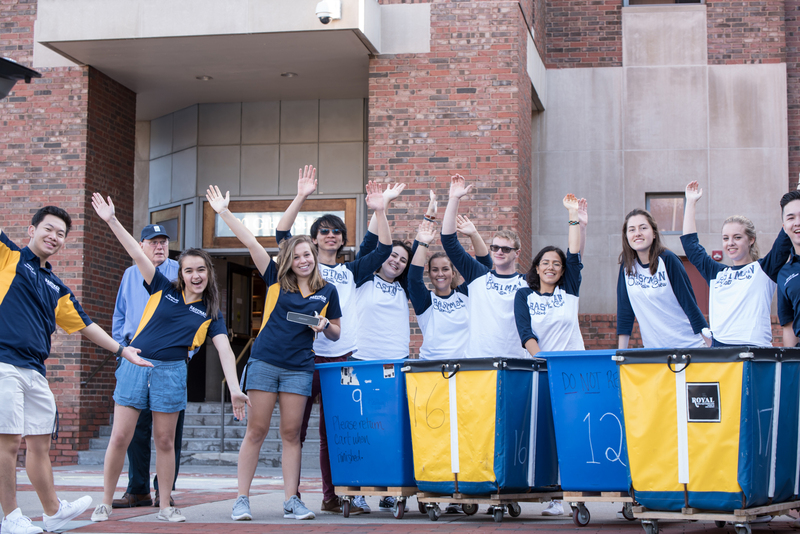 On New Student Move-In day, Eastman Orientation Committee (EOC) members will be running around assisting you in any way they can. All of the doors and elevators will be open, and there will be wheeled bins to help you move your belongings into your room. Things get pretty busy on move-in day, so as long as you come with a bit of patience, you will be moved in before you know it. Can I send my items to the Student Living Center before I get there? Your mailing address will be sent to you when you get your housing assignment letter. On Move-In Day, you will receive the combination to your mailbox which is located on the first floor of the Student Living Center. Information about New Student Orientation can be found online here. You will also receive your Orientation Folder during Move In Day.